Exercising with a heart rate sensor allows you to check how much effort you bring based on your heart rate. The higher your heart rate, the harder your lungs work, which is proportionately tied to your calorie expenditure. If you have a heart murmur, you can still exercise using a heart rate sensor, but you will need to take some extra steps to protect your cardiovascular health. Ask your doctor if your murmur is innocent or functional. An innocent murmur will not change the way you exercise or monitor your heart rate, whereas a functional murmur might require exercise modification, medications or surgery for correction. 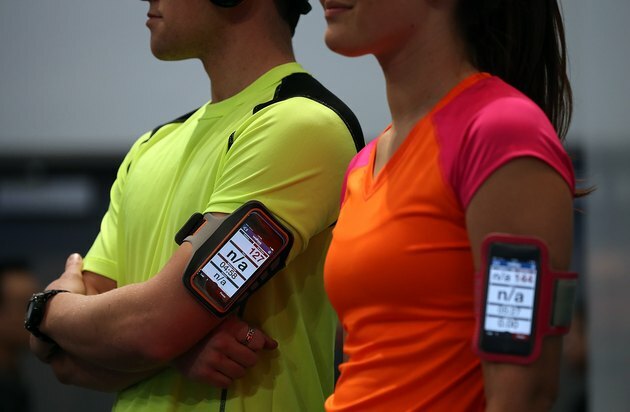 Ask for your personal maximum heart rate, or MHR, and target heart rate zones. Cardiac medications can affect your heart's ability to speed up, and you might not be able to use generic target heart rate charts based on age. Check the validity of your heart rate sensor by double-checking the readings. Place two fingers on the inner opposite wrist. Feel for the pulse and count the beats for 10 seconds. Multiply this number by six to estimate your heart rate. Check your heart rate sensor to verify whether the heart rate reading is close to the one you obtained manually. Exercise as you normally would while wearing your heart rate sensor, unless your doctor has restricted your exercise program. Watch for signs of cardiovascular problems such as shortness of breath, chest pain, dizziness or fainting during a workout and get medical attention if these signs appear. A heart rate sensor might not read your heart rate accurately if you have an irregular heartbeat, known as an arrhythmia. A heart murmur affects the flow and turbulence of your blood, but it does not usually affect the beat of your heart. National Heart Lung and Blood Institute: What is a Heart Murmur?